"El Conocimiento de las Nanoparticulas en la Conservacion de bienes culturales"
The workshop will take place on the 30th of September in Madrid, Ministerio de Educacion, Cultura y Deporte, Auditorio de la Secretaria de Estado de Cultura. In the framework of the Foro franco-mexicano para la Investigacion y la Innovacion Tecnologica, held in Mexico City (12th July 2013), some of the results obtained in the frame of NANOFORART project about nanotechnology applied to art conservation have been presented to the audience. During the 1st International Conference on Innovation in Art Research and Technology - INART'13, held in Evora (11th - 13th July 2013), some of the results obtained in the frame of NANOFORART project about cleaning and deacidification of works of art have been presented to the audience with two talks. 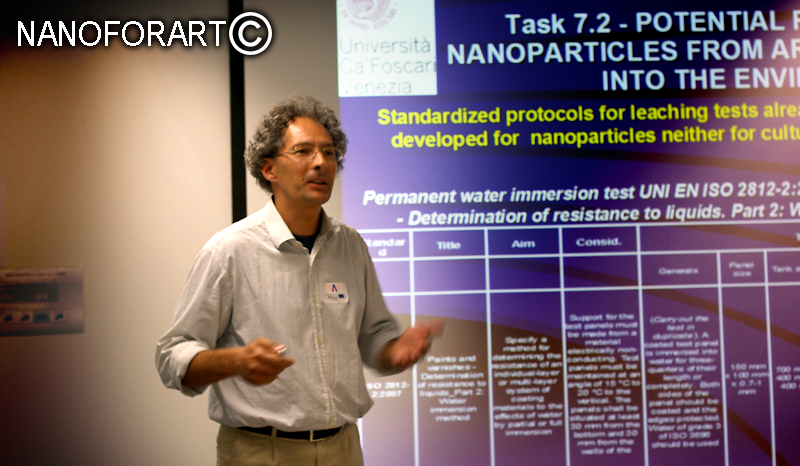 During the XLI National Congress of Physical-Chemistry (Italian Chemical Society), held in Alessandria (23th - 37th May 2013), some of the results obtained in the frame of NANOFORART project about cleaning and deacidification of works of art have been presented to the audience with one talk and three posters. The NANOFORART MidTerm Meeting has been just held in Bruxelles, in order to discuss the projects results after a year and a half of work. The precious contribution given by all the partners was carefully evaluated and the main guidelines for the following research were established. The meeting provided a unique opportunity to assess the progress on application of innovative nanomaterials for cleaning, consolidation and pH control of works of art. 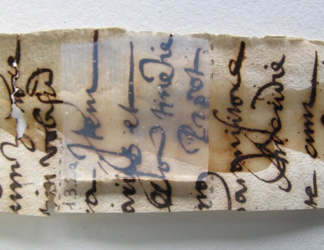 On site applications and treatment of real objects are providing positive results, while the constant interactive expertise exchange between many different restoration and research professionals has proven the key for the continuous refinement of formulations and applicative protocols so to overcome limitations. Overall, the first half of the project has produced encouraging results that lay the basis for the challenges that lie ahead. Take a look at the photogallery (Ph: Lucia Noor Melita) of the MidTerm Meeting.